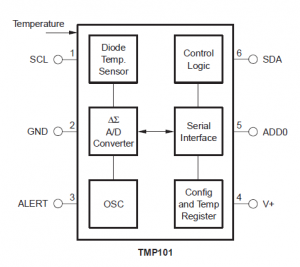 According to Texas Instrument, TMP101 is a two-wire, serial output temperature sensor available in SOT23-6 package. Requiring no external components, the TMP101 is capable of reading temperatures with a resolution of 0.0625°C. This is from a project I did in 2008. The given routines measure temperature from TMP101 and output it to the serial port of the microcontroller at one second interval. TMP101 was connected to the standard I2C pins of the PIC18F452 microcontroller used.